Laura is a first year student at the IS academy and is the IS cadet representative from Germany. A genetically engineered super soldier, Laura is a member of the German military and holds the rank of second lieutenant. 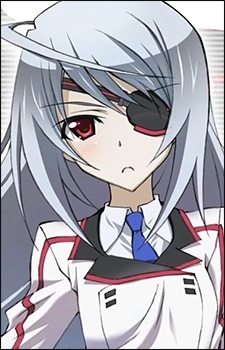 She has one red eye, long silver hair, and a black eye patch over her left eye. Laura was under Chifuyu's guidance when the latter was working with the German army's IS divison and holds Chifuyu in high regard. She easily defeats Lin and Cecilia but later loses against Ichika. She has a bandage over her left eye that had been subject to a failed experiment with nanomachines and if uncovered would overload. In despair at not being able to become stronger, she starts to admire Chifuyu Orimura, but when Chifuyu withdrew from the Mondo Grosso 2 tournament to save her kidnapped brother she began to hate Ichika from the bottom of her heart. At first she hated him and wanted to kill Ichika in a battle but she was defeated by the boy twice (even with the Valkyrie Trace System active). Later, in the Inter-IS subspace the two talk and when she asks him what real strength is, Ichika responds: "being able to do what one wants to do" and "being able to help those around him." This makes her think back to a discussion with Chifuyu who had told her to be careful of the great and mysterious power of Ichika that can make any girl fall in love with him. From that moment on she begins to protect him from the other girls and declares that he will be her "bride" (because of a misunderstanding in her knowledge of general Japanese culture). Laura pilots the Schwarzer Regen IS. Has more than 20 million euro in her bank account, but doesn't know how to withdraw money.